Judging of the annual Andover Town Centre Festive Window Competition, organised by the Andover Town Centre Partnership, took place in the Town Centre this week. Town Centre Manager Gemma Thompson was joined by The Mayor of Test Valley, Cllr Ian Carr, Cllr David Drew, Cllr Iris Anderson and Cllr Len Gates to judge this year’s entrants. 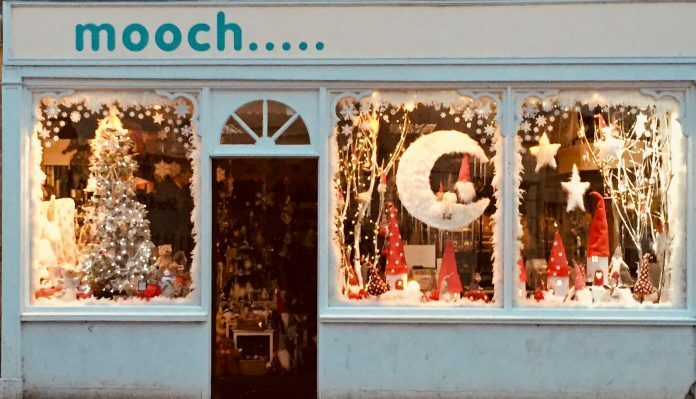 Despite a record number of businesses taking part and a very high standard of designs, the judges unanimously agreed that Mooch on Bridge Street were worthy winners. They were also particularly impressed with Jim’s Barbers, Craft Spot and Mailboxes who were awarded joint runners up. Gemma Thompson, Andover Town Centre Manager commented, “Thank you to all of the Town Centre businesses who have made the Town Centre look so festive. Our congratulations go to the team at Mooch who created the winning window display. The judges were very impressed by their stylish and eye-catching design”. Georgina Roberts of Mooch said, “We are absolutely thrilled to have won the Andover Town Centre Partnership Christmas Window Competition. Thank you to our talented assistant Vicky Coulson for creating such a wonderful display! We know that the children (and adults!!) of Andover have enjoyed looking at our window display from the “ahh’s” and “ooh’s” we hear….This year we are donating the prize of £50 to Rosie’s Northern Lights Trip for a very brave young lady who is undergoing a second round of chemotherapy for a brain tumour.